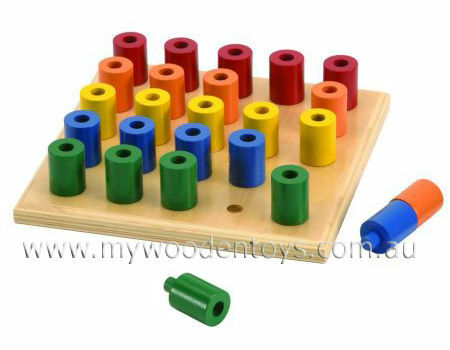 Stacking Wooden Peg Board Toy has 25 brightly coloured pegs that can be arranged into lines and stacks of colors. A wonderfully simple toy for the fingers and imagination. All the pegs can be fitted into one another creating stacking towers. See how many pegs you can place one on top of the other to create a lovely long bending rainbow. See how far the stack can bend before it topples over. This is a lovely solid toy with a strong varnished baseboard with 25 holes to accommodate the pegs. The pegs can also be used for addition and subtraction and provide a colourful physical way to get to grips with numbers. A truly versatile toy, it is hard to tell where play and education start and finish - and that's just how we like it. We like this because: "It can be used in so many ways and the line between play and eduction is nicely blurred. I have received my order. My daughter is very happy = A happy mum Thanks kindly.